Divorce can be an ugly word when you’re on the receiving end of getting served papers. There are many reasons why people divorce. Some of their reasons are valid, some are not. All are heartbreaking. 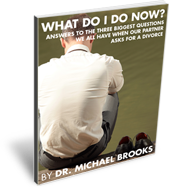 Divorce is a momentous change for anyone to go through. Whether you’re sure things are beyond reconciliation or your partner has asked your for a divorce you were never expecting, there are things you need to know and emotions to go through, and going through these things alone can be incredibly difficult. The important thing to remember is that you don’t have to go through this divorce alone. Whether you’re looking for personal coaching through this difficult time or just some advice for what you can expect, a good place to start is my free ebook. You can sign up just by filling out this box. Free eBook: What Do I Do Now?